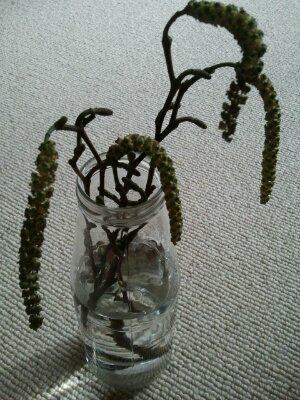 Walking home from work today, I found some stunning catkin laden branches, lying beneath a street tree. The male catkins of this tree are very long and very colourful. I decided to take some of the fallen branches home. I then removed most of the catkins (to preserve the energy expenditure of the branch) and split it up into manageable pieces. Some of the lower bark from each branchlet needed to be scraped back and then each was placed in a vase of water. I have hopes that a few of the small branches will send out roots and become new plants. The street tree that these branches came from is an Italian Alder (Alnus cordata), apparently a popular street tree due to the catkins, its overall beauty and vigour. It’s possible to find beautiful cones, inconspicuous female flowers and the enormous male catkins, as well as large leaf buds, all at the same time. I was pleased to see that today. Alder is the only deciduous tree to bear cones. Alder is linked to much folklore and tradition. It’s a wonderful tree with many uses. Look up Glennie Kindred, particularly her Earth Wisdom book, for lots of information about this tree (and others). It produces several beautiful dyes. The leaves are usefully made into a cooling, soothing poultice or compress for swellings. Much like Plantain (Plantago sp), the leaves can cool and soothe the weary feet of travelers, by simply placing them inside of footwear.